One of these was Warwick Road. In today’s article I want to explore why down the years it has featured strongly in local newspaper coverage. As befitted a major trunk route and the growth of motor traffic during the 1920s there was corresponding provision for the needs of motorists. Warwick Road saw the appearance of local garages which increased in number as business grew. There were developments by Youngs, Shire Motor Company and the Banbury General Motor Company. Each enterprise was an agent for a different range of vehicles, yet such was the determination to succeed the last of these made much of the slogan for Riley’s Cars ‘being for the man who would reach the height of performance without plunging into the depths of his pocket’. Mr Young was equally determined about sales and in 1938 he organised a visit to Ford at Dagenham for prospective buyers of vehicles from his garage. In 1954 forecourt improvements by Youngs heralded a new era, one in which a more effective showroom enabled the garage to display a wider range of Ford cars. This gave them a possible edge over local rivals. By 1971 Hartford Motors had opened up on Foundry Street corner of Warwick Road. It was here tractors became part of an expanded business. The other needs of travellers were not neglected, Vera Wood in her book the Licensees of the Inns, Taverns and Beerhouses lists five premises catering for the needs of locals and passing traffic: Barley Mow, Crown, Duke of Wellington/Sun Rising, Eagle and the Warwick Arms. There were also small shops. Apart from one service station with associated shop selling food drink and newspapers, the present Warwick Road presents a very different image. 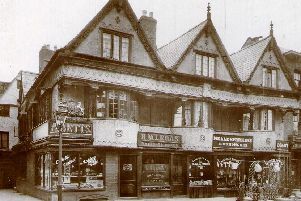 In place of Youngs is Bennetts Furniture Store and the huge complex of Hartford Motors has been replaced by flats and town houses. This is a continuation of housing development that started post First World War when the suburb of Ruscote was developed. Part of this was the addition of 92 houses (some council) built along Warwick Road. Car related accidents often merit a few column inches on inside pages of local newspapers. However on May 4, 1960 the Banbury Advertiser and the Thursday Banbury Guardian reveal the full horror of one incident. The Banbury Advertiser was first with the news of the crash and led with the story on its front page, headline ‘Soldier dies as car hits house’. He was 22 year old L/Cpl John White of Birmingham and on his way with four others to Bicester Camp. Both papers tell how having passed the police houses he failed to negotiate the bend at the bottom of Ruscote Hill. The Austin A90 containing the five soldiers hurtled across the grass verge, damaged a telephone pole, demolished a tree, cleared the 3ft high garden hedge of 253 Warwick before becoming embedded in the corner of 251. First on the scene was Stan Hodges, a bricklayer and former soldier who had been looking after one of his children when the crash occurred around midnight. ‘I heard two tremendous bangs and I saw the car hurtle past the window’. He went outside and released the driver who was pinned behind the steering wheel. His wife Irene collected all the blankets she had and they rendered what help they could until the ambulance arrived. Despite their efforts John White did not survive. A council inspection revealed the impact cracked the brickwork in the bathroom and staircase wall of 251 and burst open the door. The occasion was marked by the courage shown by Stan and Irene who surely must have been stunned by the scene that confronted them. That they were able to help the four other seriously injured men must have aided their chances of recovery.